The distinctive nature of the European pe/vc environment is on display in Stefano Caselli’s presentation of its complete conceptual framework, from the volatile (its financial side) to the stable (its legal organization). A Bocconi University professor, Caselli offers a European perspective on market fundamentals, the v.c. cycle, and valuation issues, supporting his observations with recent examples and case studies. Written for investors, his book achieves many "firsts," such as clarifying many aspects of EU and UK financial institutions. Complete with finding aids, keywords, exercises, and an extensive glossary, Private Equity and Venture Capital in Europe is written not just for Europeans, but for everybody who needs to know about this growing market. Primary: MBA and Advanced undergraduate, MBA, and Executive Education students Studying Private Equity and Venture Capital in UK and Europe. Secondary: Secondary: MBA and Advanced undergraduate, MBA, and Executive Education students Studying Private Equity and Venture Capital in US and Asia .May also be used as a supplemental text in Corporate Finance courses. III. VALUATION AND THE "ART OF DEAL MAKING"
Stefano Caselli is Vice Rector for International Affairs at Bocconi University whereas is a Full Professor of Banking and Finance at Department of Finance and member of the board of directors of SDA Bocconi School of Management. He is also the founder and the director of the “Start-up Day” platform for Bocconi since 2015, devoted to facilitate the start-up process for Bocconi students and alumni. His research activities focus on the relationship between banking and industrial system, facing issues both of banking credit risk management and of corporate finance and capital structure. He is the author of numerous books and articles on the subject. His works have been published in Journal of Financial Intermediation, Journal of Banking and Finance, European Financial Management, Journal of Financial Services Research, Journal of Applied Corporate Finance and Economia & Management, among others. He has got a long experience as independent director in several boards of corporations and financial institutions as well as advisor of investment committees (among them: SIAS S.p.A., Generali Real Estate, Santander Consumer Bank, Fondazione Cassa di Risparmio di Padova e Rovigo). He acts as columnist and opinion maker on “L’Economia del Corriere della Sera”, as well radio and television programs. He is research fellow of BAFFI-CAREFIN (the research centre for financial innovation of Bocconi University), member of the board of directors of ISBM – International School of Business Management, in UK and member of the Strategic Board of CEMS. He won several times the “Bocconi Teaching Award” and the “Bocconi Research Award” in 1997, 2004 and 2011. "Professor Caselli’s views fill a gap in the market dynamics of private equity, both before and after being affected by the financial crises. His work offers a complete review of the business, balancing a rigorous academic approach with the insider experience of the applied profession; it's great reading for academics as well as for practitioners." 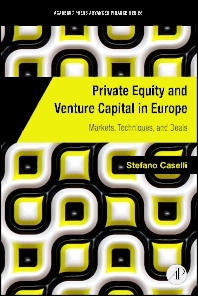 I have adopted the book for my private equity and venture capital course in one of the Master Degrees at Sapienza University in Rome. It is a great text book.